For example, in March of this year a fire in Mississauga, Ontario, was directly linked to rodent damage to solar cabling. The Illinois Department of Public Health estimates that one quarter of all fires are due to “unknown causes,” many of them likely rodents chewing on wires and creating a short circuit. Here’s a fact worth considering: a squirrel’s incisors can grow to six inches in a year. 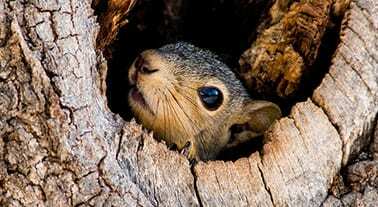 To keep their teeth worn down squirrels will chew anything at hand, and if they are nesting in a warm, dry location such as under a solar array, they will chew on wires, insulation, or anything in the immediate area. Failure to prevent rodents and other pests from nesting under your solar array can be costly. The average cost to replace all the wiring and micro-inverters due to rodent damage can range from $3,000 to $4,000 per service call. That’s a substantial cost to customers, and can be even costlier to installers if they have to service a system that is still under warranty. Note, too, that the CE Code specifies the possible use of “expanded metal, solid metal, and screening” as a protective screen. Installers should consider the materials that work best to do the job in terms, taking into consideration longevity and effectiveness as well as ease of installation. Any solar installer who has tried to protect a system using chicken wire can attest to the difficulties. Wire mesh is not only difficult to handle, it’s hard to install and requires special clips or tools to attach it to the solar system frame; techniques that could prove to be impermanent or in some cases, invalidate the module warranty. And chicken wire will fail over time, leaving gaps that will allow critters to nest under solar systems. Similarly, solid metal solutions can be difficult to install, but more importantly they do not allow for adequate circulation which would raise backside module temperatures above recommended ranges, not to mention making roof inspection difficult. SolaTrim addresses these challenges right out of the box. The SolaTrim protective barrier is made from diamond-stamped aluminum – rigid enough to provide lasting protection while allowing air to circulate. And SolaTrim panels are installed using a peel-and-stick adhesive that has been tested for long-term adhesion in any weather conditions at any temperature, so there are no clips, screws, or rivets that could invalidate a warranty. Plus, the SolaTrim barriers provide an attractive, finished look you won’t get with wire-cage products. Unlike Canada, the United States doesn’t have a national electrical code for solar, although smart solar installers see the advantages of including SolaTrim protective barriers with their solar installations. Not only do SolaTrim protective barriers reduce service costs, they improve the look of the finished system and increase customer satisfaction, which results in increased referrals. For both the installer and the customer, the added protection will more than pay for itself over time.